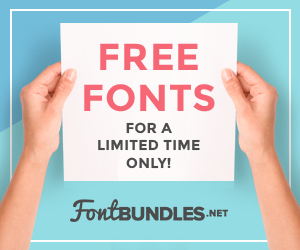 I share a lot of great font deals, from my favorite design places like Creative Market, Font Bundles, Mighty Deals, and The Hungry JPEG. Nearly every time I share, I get a few newer users who don’t know how to install fonts into their computer. No need to worry, I’ve compiled a list of how to install fonts for popular operating systems below. After you install new fonts, you’ll want ti close any program you had open and reopen it, your newly installed fonts will then show in the program. That’s it! Now, go and find some new fonts for use in your Silhouette or Cricut business! Be sure to check the licensing, you’ll need a commercial use license for anything you plan to sell. Stay tuned to Cutting for Business, we are going to be talking fonts for a few days! Was this resource helpful? If so, share it on your favorite social media by hovering over it. When I do this and try to write in these fonts, all I get is an outline. How do I write with these fonts? Hi Ashley! You would need to fill the font with color to see it on the screen filled in. Hope that helps! Google it, and remember, you’ll want to use it for personal use only. Hello Christine, can you please advise on how to do this filling of color. I am using cricut machine and when I write these fonts, it just writing the outline. Thank you. Hi Leah, From the Layers panel, click on the once on the layer and you can choose the fill color. Hope that helps! Is it possible to save them to an iPad to use? Hello Christine I’m excited to have found this thank you for share plus teaching. I just have 1 question how would I download on my iPad Pro this is my first Apple product I’m still learning. Thank you again for all that you share. Is there a tutorial on how to install the design or craft files I download? And how to get them into Silhouette? Hello! You’d save them to your computer. Then, from Silhouette Studio, click “File”, “Open”. I read a post https://windowsclassroom.com/install-fonts-windows-10/ who says that we can download stylish font from third party and install in our windows 10. Is this possible or we can install font only from windows store.